I do not recall which character of mine actually found it, but I stumbled on a +2 Spear with +1d6 Acid Damage. I know you can find and buy far better weapons these days, but for some odd reason that weapon still caused my jaw to drop. I knew I had to make use of it somehow. While some of you might first look into the direction of the Stormlord PRC, I did not. What I started to think was actually an elven warrior of some kind, a master of the spear, a man that lives and dies by this weapon I found. I could not shake the idea off. Thus little by little I started to think possible builds that I could make. At one point I did consider some manner of a Barbarian/Duelist Build. The combination might sound off, but it has some interesting perks to it. For example the Haste granted by Duelist PRC really works well with the Standard Rage from the Barbarian base class itself, and both lend well with Northlander Hewing. The Duelist PRC also increases reflex saves, which in turn can produce a greater return with the Barbarian's Evasion feat. The +2d6 damage with piercing melee weapons and the chance to let parry skill cover for the Deflection item were also nice perks on top. In otherwords, Barbarian Spear Duelists can be something scary. But since my current character list is already Barbarian heavy, I started to consider something else. I eventually leaned in favour of a Fighter 10/Duelist 10/Shadowdancer 10 build. Mechanically, I think the Barbarian Spear Duelist would be the superior choice, while I think this class combination would better match my idea of a spear warrior. At this point I did consider going human for the extra feat, air genasi for the stats, and thiefling as well for the latter reason. But the idea of an elven warrior did not leave, and thus I RCR-ed my low level Conlock into a strength based Wood Elf Fighter/Duelist/Shadowdancer. Simply writing it down here made me cough, because Shadowdancer requires that 19 dexterity, stealth skills require intelligence for the skill points, and naturally I need strength for both damage and AB, which automatically results in negative wisdom and charisma modifiers. I had some skill points to spare, which I had originally planned to place on Sleight of Hand, but I decided to put those in Diplomacy instead. Words will not be the blade this character wields, but he will end up with some investment nevertheless. Thus <>Redacted</> began his journey in the Northern settlement of Soubar. He took up some few quick errands before continuing on his way to South keeping himself between the wilderness and mortal danger. He may have stalked some group in Hilltop ruins out of curiosity. I hate gnoll occultists and level scaling. The spells they got can really pack a punch, and for now they can also hide behind the damage reduction granted by Stoneskin, and Mirror Images. Alone they are not an issue, but they tend to spawn with a few Gnoll Maurauders in the second level of the gnoll cave. That corner is deadly for my character at least for while longer. I know that partying up and Spell Resistance would solve most of those issues. Alright, so I logged in and went to FAI to sell of whatever I had previously managed to acquire on my character. Most of those items went straight to the dwarven merchants, but there were two that I decided to put up for sale at the in game consingment store. A Mithral Rapier with Massive Criticals 4 for 4,999 gp and a Longsword with 5% chance to inflinct one round blindness at DC of 14 for 14,999 gp. Both weapons will serve anyone with the access to Greater Magic Weapon spell, thus I am hopeful towards finding those items in some epic trade only list. But as I was about to leave FAI, I did notice that there was a loot bag at the feet of Mudd, or whatever his name. I couldn't help my curiosity and I did spend a good long time trying to click it, which eventually worked with the right camera angle. Thus my character was holding onto a tower shield, perhaps not exactly one of the most epic items around but it had a property that made it convenient for loot grinding. Thus I was holding a shield I could not exactly claim to have belonged for myself, and thus I started sending tells left and right if someone was missing a tower shield. I put up a line on the scrying tool, started a forum thread, and basically sent tells to half the server. I got a lot of smiling faces but no one seemed to have lost a shield that they owed. After a while I grew bored of standing outside of the FAI gates and I decided to take my character to the cloakwood to slay some lizardmen. I know that today the mobs there are Tasloi, but in my heart it will always be lizardmen. The fight towards the Cloakwood Mine did reveal an unfortunate trait of my current character build. My character has rogue saves. Thus he actually got stunned fairly often by the Tasloi Shamans. Now, Fighter hitpoints mean that I do not have to worry too much about taking hits for a round or two, but I was shocked to see how often my character got stunned. And inside the mines every single spider actually managed to poison my poor elven character. On the third floor I swung the rope, and then noticed that there was a golden Batiri Chieftain on the other side. As I am not one to ignore a larger bag of loot and experience, I had my character swung back to the otherside, and it sprawled into a fight with we other Batiri at the side. I actually turned on the Parry mode and had great laugh until the Batiri Chieftain managed to both wound and poison my elf, and after that the Parry mode just started to fail one attack after another. I was shocked to be wounded and poisoned, and thought that perhaps the Batiri Chieftain was carrying some epic loot which did not appear at the end of the fight. But still, it was a fun fight all things considered. Over all, I did end up crawling out of the cloakwood mines with 3 suits of banded mail, 2 half-plates, 1 breast plate, 1 full-plate and an extra pair of chain mail. I suitable reward at the cost of about 7 potions of Lesser Restoration and Bull's Strength, which the merchant inside FAI was glad to indentify and purchase. The trip alone netted my character some 15k in gold pieces. My character then headed towards the sea cave for some good old troll slaying, what else to do with an acid tipped spear? He tangled and came on top against a group of six trolls that included two boss monsters. I had to log out after that. The elven warrior <>Redacted</> had found his way at the Friendly Arm Inn where a dwarven merchant demanded an extortionist price to identify the magical wards bound within the many items claimed as loot during the past few days. Surely there would be someone willing to do the service cheaper, but our warrior required a restock of basic supplies and necessities. The coin exchanged hands, and the dwarf was willing to purchase most of the acquired items but <>Redacted</> reasoned that there might be hands willing to pay more for two of the weapons. One rapier and longsword with curious enchantments on each. But <>Redacted</> was not a merchant himself, the mere thought of standing still and screaming about his goods felt alien. Thus he decided to turn towards services provided by the local proprietor of a consignment wagon. Many adventurers had talked with the fellow, and surely it would be a fast way to exchange the two unneeded weapons into more usable coin. With all said and done, <>Redacted</> was ready to leave the relative safety of the Friendly Arm Inn, but a curious sight cought his eye. The proprietor of the consingment wagon, was standing upon a tower shield that he did not claim as his own. It took some effort but our elven warrior did manage to dislodge the shield from the mudd and then became a curious task of finding its owner. After all, it was strange to see a shield of such quality to be left rotting into the mudd. But not a soul inside the walls were willing to claim it as theirs and when it was presented in their direction, and thus <>Redacted</> thought that it might be a idead to go stand near to rocks by the entrance. People came and went and not a single one wished to claim the tower shield. 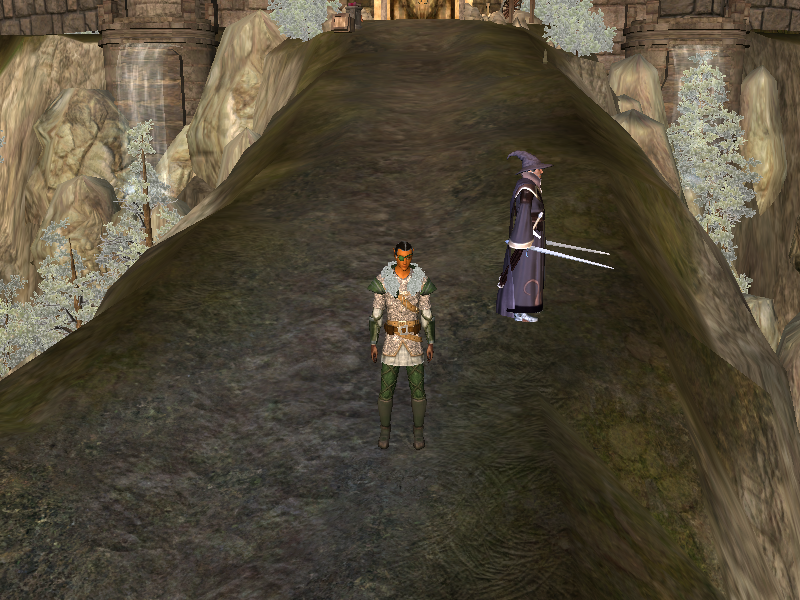 Although there was a man of some elven heritage that did seem to consider it at least, judging from the way he stopped and kept slowly moving onwards. A curious sight and perhaps he could have been the owner, or perhaps this half-elf was simply waiting to see whether the elven lineage brought forth kind or nasty words. <>Redacted</> did wonder for a moment how the sight of the muddy tower shield might have appeared with his otherwise silent nature. Hours of the night waned and no one wished to claim the shield, and thus <>Redacted</> could not do much beyond leaving a note scribbled at the gates of the keep and return to the dangers of the wilderness. The Tasloi shamans were a nasty bunch to fight, their spells often left <>Redacted</> vulnerable to the blades of their other ilk and their trained battle beetles. But the elf with the spear lingered on longer and even the fierce beetles met their match. The caves, or better described as abandoned mines proved another interesting challenge in the form of a host of spiders. The creatures were not much of a threat to a skilled spearman, but their mandibles did come with a poisonous bite that required considerably effort to heal and recover. Potions of Restoration and Healing Kits were spent by half a dozen, and the cursed goblins had used the same spider mandibles to trap their chests. It brought a small smile to <>Redacted</> face to battle against their leader and return in kind every single scratch and fang mark left by those accursed mandibles. Not to mention that this victory came with its right of spoils, in the shape of a dozen suits of armor and another burden to carry. The fortress of Candlekeep was the nearest civil settlement in <>Redacted</>'s eyes and it was there where he dragged the dozen suits of armor. With some luck a somewhat shady fellow at the entance became willing to purchase the burden off from <>Redacted</>'s shoulders. Perhaps he knew a friend of a friend that allowed him to sell these armors to the keep for a profit, but for now coin was coin and less of a burden to carry. Restocking at the keep proved to be a challenge of its own kind. They sold many interesting things, but were lacking in Potions of Restoration. Perhaps their keep was free off poisonous spider mandibles as the locale did have its share of sea winds. 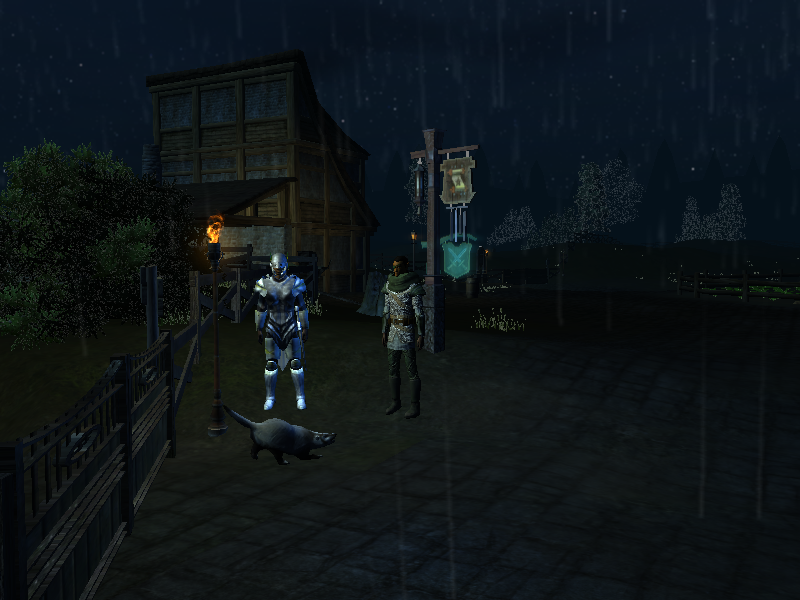 Those important supplies had to be acquired elsewhere and thus <>Redacted</>'s decided to try and hitch a boat ride back to the city of Baldur's Gate... But there was a cave along the way, and a fair fight to be had with the trolls that called it their home. If Candlekeep doesn't sell Potions of Lesser Restoration, it really should. I mean, they got potions of Heal, so the lack of restoration feels odd. Held at staff point by Shaundakul. And I think I should change the screenshot format away from .png, since my screenshots are always missing something! 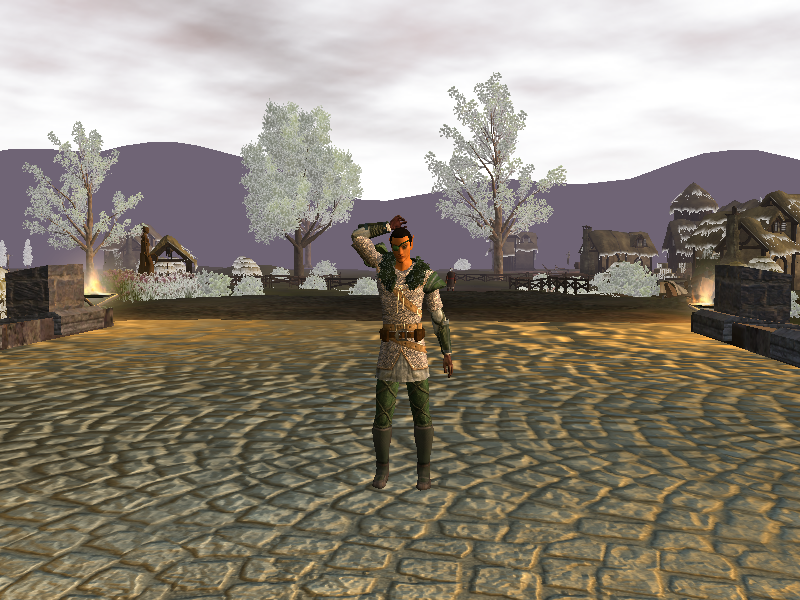 Logged in and appeared in Friendly Armn Inn, went to Cloakwood, then Mines, Troll Sea Cave, and sold loot in Candlekeep. The potions of Lesser Restoration were at infirmary as advertised in a forum PM. About 15k gp in profit after restocking with potions. Adventure, danger, forest monsters and cave dwellers! Not to mention that little by little <>Redacted</>'s hatred towards spiders is growing ever higher. Candlekeep sells potions of Lesser Restoration inside the infirmary. Basically, you sell stuff to the merchant at the entrance, and have to go inside two different houses to restock on both potions of Lesser Restoration (ability score damage removal) and Bull's Strength (general carrying capacity). I have been to the Cloakwood Mines a few times and the poison DCs in the area tend to be around 20~. Whether it is mobs, traps on the ground, or traps on the chests, it really feels like a low fortitude character has no choice but to be poisoned again and again. And this is when the experience from regular mobs is falling under 50 and 25 with a level 12 character. I think it partly explains why the area doesn't seem to get used these days. With a low fortitude save character the poison has about 75% chance to trigger. I still do not know what that man was doing there and for a while <>Redacted</> watched in silence as this strange purple man brandished a pair of swords at the sea and shore. Perhaps he was taunting the rumoured invisible silver dragon of Candlekeep. It seems a scarf made out of Nymph's Hair does make one well liked even in the most dank places of the region. Thirty minutes running after a badger, looking through every bush and batch of grass and for all that time it was actually being petted by some bored guardsman! 'Into the basket you annoying Radger and back into guard duty you lazy bum!' - A thought ran in <>Redacted</>'s mind. Cats are not supposed to be this big! They are not! Indeed, it was a time for a strategic retreat. 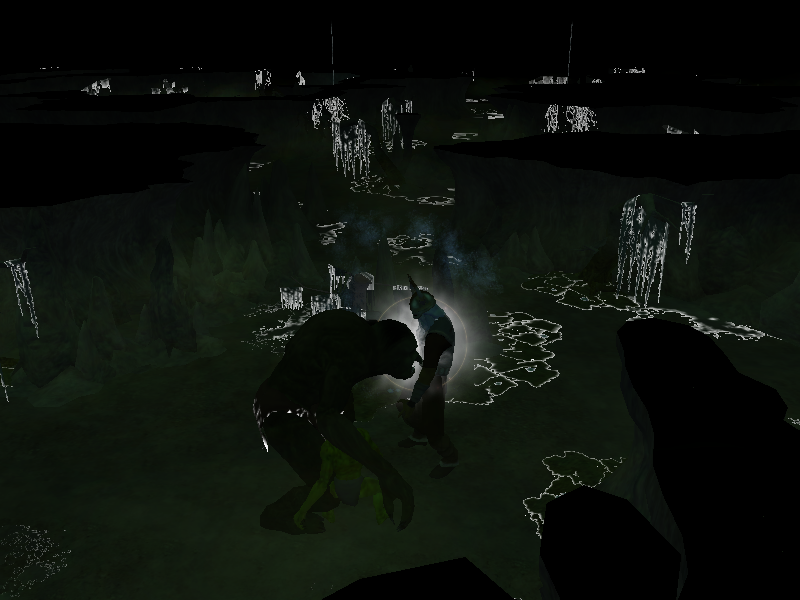 The Goblin Mine and associated old ruins is much more pleasant these days. If you you go through the cave in reverse order, it is quite likely that the Toothsayer will not spawn to hinder your passage. It might not be the designed intent, but that boss can often be a bottleneck for character as high as level 15+ and it makes the key fetching quest easier to do. Parry mode works and then it doens't. It is curious, but one more level and I think it should work more reliably. Elves are boring. It is much more fun to play as a frost giant. I found a moment to play and remembered that one of my characters was quite close to leveling up. Thus I went to the Troll Claw Fjord Cave to see how well my pre-polymorph change Fighter/Sorcerer/Arcane Scholar/Eldritch Knight fared compared to the single class wisdom based Ranger of mine. And I admit that it had been a while since I played on my dwarf, thus it felt like something entirely fresh. It took about 30 minutes to earn something like 400-800 points of experience in order to level up. And fifteen minutes more to contemplate whether I wanted another point of constitution or charisma. 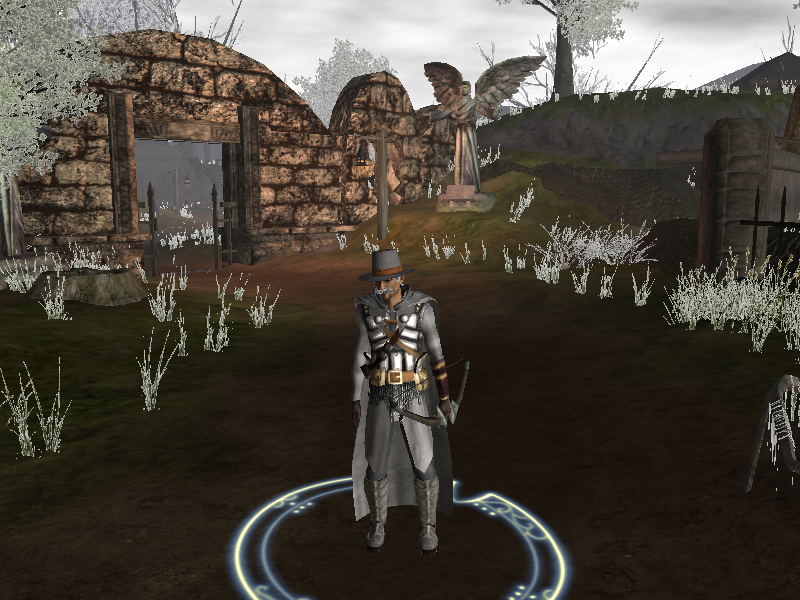 Oh, and it is going to take one more level before this character of mine will have Augment Form! It is not so bad, the build was designed to be a Polymorph Gish and already has BAB without the Augment Form feat. Anyhow, someone sent a tell and asked me to join up at Reaching Woods, a location whose location I had pretty much all but forgotten about. I think I said I had about an hour to go and perhaps 30-45 minutes of that hour was spent on trying to reach the unreachable Reaching Wood. Well, I did I did stop few times to try and figure out an answer to some question about Rockrun, and now a big part of me is actually dreading that it might have been me that named Rockrun, Rockrun. I hope it is not the case... But what can you do! When I finally reached the unreachable Reaching Woods, I teamed up with some arcanist after a bit of a talk and emotes. Killed the boss, encountered two others and I had to log off. 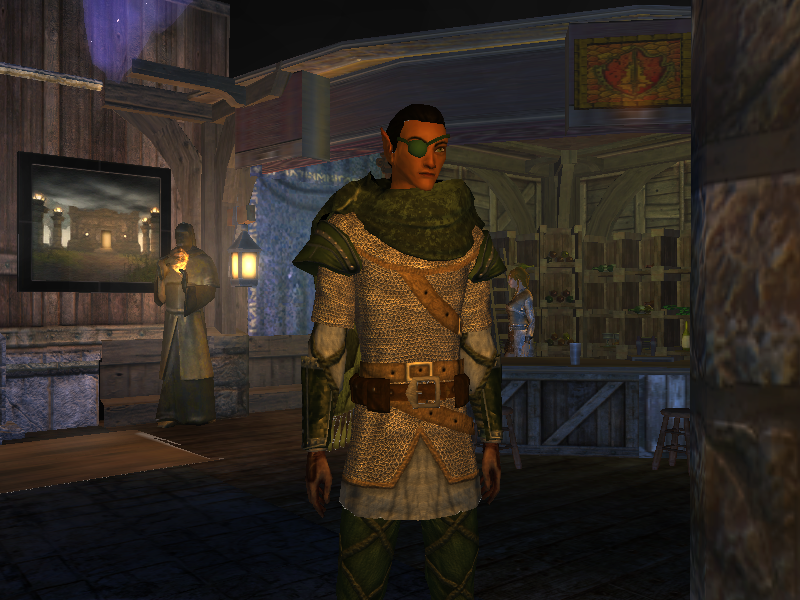 A strange man was found standing in the woods, he had apparently gotten into a pickle due to a marriage with some fiendish gnolls and wished to acquire a divorce with a clearly cut severence package. Or at least that is what my dwarf recalls of the encounter with that negative wisdom modifier of his. I do like the polymorph changes. 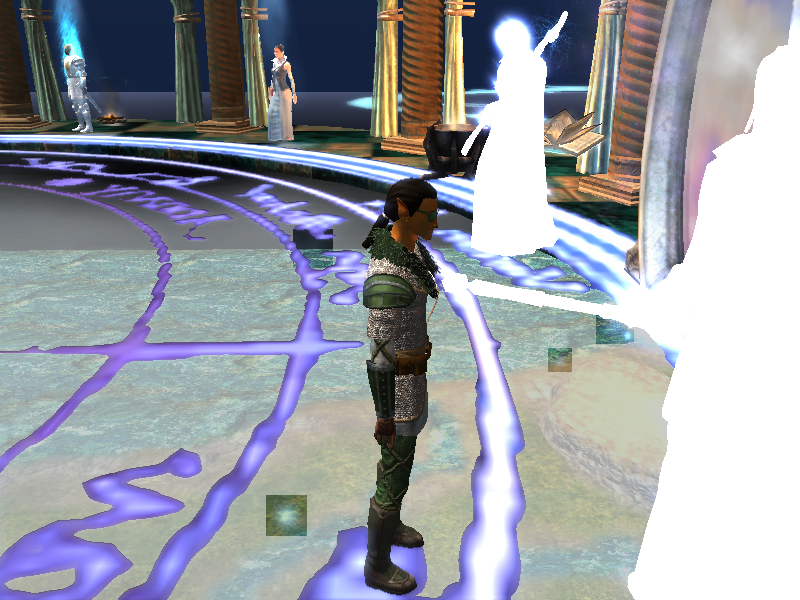 Shift Form was one of the best things added to the server, because now my Polymorphing Gish can really get the mileage out of his spell selection. In simple terms, it no longer takes a 9th level spell to refresh Elemental Shield/Death Armor/Cloudkill. While the more proper arcanist did slay gnolls left and right with his spell selection, summon and eventual Shapechange into the Arboreal elf, I have to say that my build had far greater longevity thanks to Fast Healing III. I mean, I got that regeneration and the +2 Vampiric property from Frost Giant form and it all just meant that my character was healing far faster than what he took in as damage. Even at something as low as 36 AC. It might be a different story in a more challenging area, but my Transmuter Gish does feel like almost unkillable, and the funniest thing is that he has more HP out of Shapechange than in it. Laitae's Second Chance does feel like somewhat OP spell. 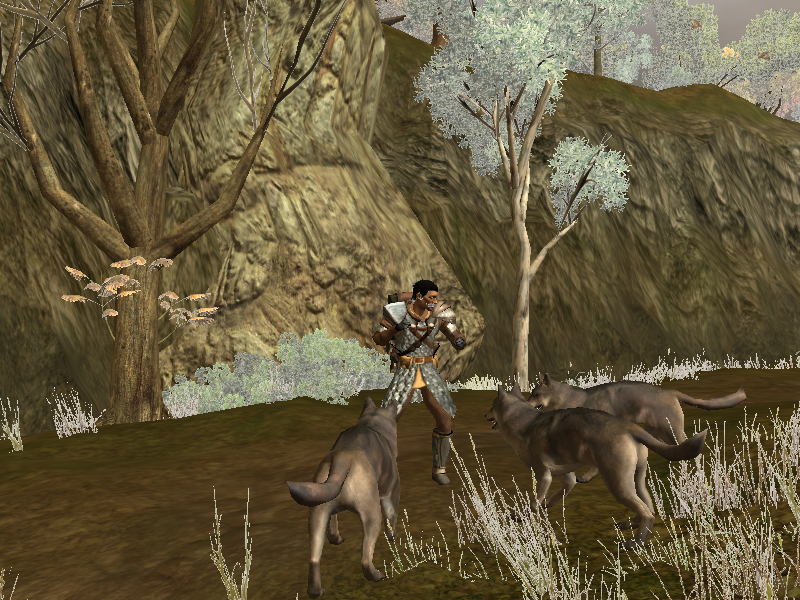 Hoiher Daciner wrestles with three hungry wolves somewhere along the the river Chiontar. Hoiher Daciner in his full adventure gear after reaching level six, maybe. The level up was just one experience point, or a zombie away. A Damaran by the name of Hoiher Daciner was born and raised in Vaasa. The region of Vaasa is located north of the Eastern most shores of the Moonsea, behind the Galena Mountain Range and south of the Great Glacier. It is a region best known for the sporadic farms and the occasional wandering monster, alongside with the occasional fortune seeker. The Daciner family gained its living from farming the land, and there was more than enough free land to be claimed, but the young offspring of the family had always desired for something more. While the necessary tasks of shovelling peat, chopping firewood, and turning soil brought a living, it did not promise a satisfying life for Hoiher Daciner. The only time he truly felt free was when he was hunting for hares with his own makeshift bow, and as years went by the practise of archery was perhaps the only thing that kept him sane. The many dangers found at Vaasa meant that there was always a demand for the skilled swordsman or archer, and this is where Hoiher Daciner first got the taste towards the mercenary life. There were risky tasks that could take few weeks or months to complete, butalso pay enough to feed a family for a year. Thus his skill with the bow and demand set him forth on the road that led him far away from Vaasa. Caravans always had a need for someone with keen eyes, and a steady hand with a bow. A bandit given a warning shot at a distance would have plenty of time to reconsider the viability of waiting for another target. Thus a caravan after a caravan, Hoiher Daciner was pulled further away from his home and the lands South and East tended to be claimed to a much higher degree than the now distant plains of Vaasa. He especially took note in Cormyr how his family had fields the size of noble men, and although the southern fields were more fertile, the nobles only really considered the amount of land they owned. Thus little by little Hoiher Daciner began to entertain the idea of being of noble birth himself. A whiff of arrogance, a mysterious backround, and he fitted the role of a noble's son that had ran away from home. He did not have to lie, it was just something assumed. Thus he eventually found himself staring at the Eastern gates of Baldur's Gate. He found it just a city among the rest, and talks with local Merchant's League send him to scour out a nearby den of bandits. He made short work of them of course, but one dwarven vagabond did manage to dodge his arrow and flee. Perhaps it would be something to be corrected at a later point, but for now he had been paid well enough for returning the stolen goods. The build was a Wisdom based Fighter 20/Order of the Bow Initiatiate 10. The build would have high wisdom, enough dexterity for Manyshot, the usual Weapon Focus and Specialization feats with Longbow, but what made this build interesting for me was the addition of Combat Focus feats in addition to Improved Unarmed Strike, Stunning Fist, and Ki Step. Ki Step could be used as a way to flee from enemies, which meant that the character was not bound into the usual stealth based skill investment. Plus a part of me also like the idea of using Ki Step to deliver a Stunning Fist attack on a low will save target, not that it would work against players... But the idea was amusing. The character also had high Taunt skill investment as a way to debuff enemy ACs a little bit. Taunt skill is easier to use with a ranged based character rather than a melee one, because Taunt skill has the tendency to be pushed back by standard attack action. I think the server might have made Taunt skill more usable too with a custom change... Not sure of it. You might not know this, but I have been thinking about making a wisdom based fighter for a long time now. Fighter 30, with ability score points spammed into Wisdom... and I did go through a number of different builds before finally settling down with the above. 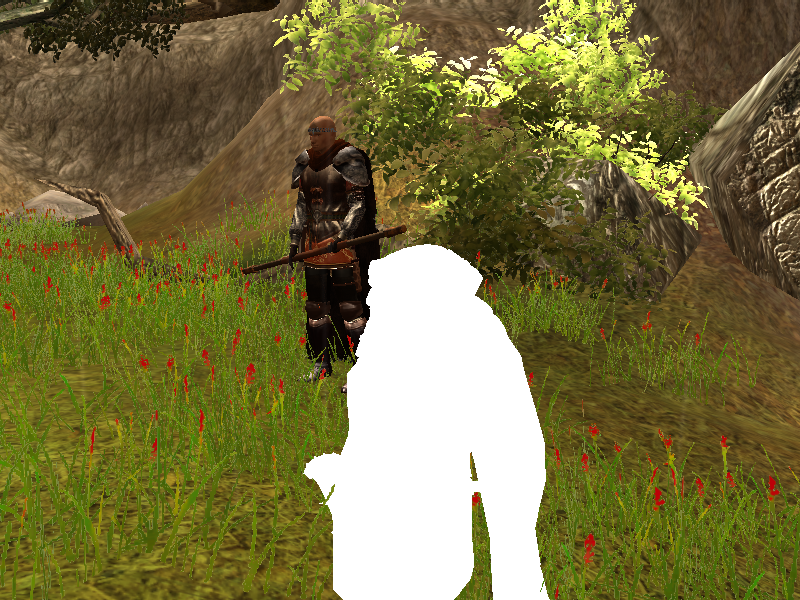 One of the potential builds was one that had taken all unarmed and ranged feats, others were focused on unarmed. You know, I was putting together builds that should not work and finding that those could. Also, a ranged character without self provided tank or stealth skill to lean on, there would be a higher incentive for this character to team up and get involved. As a mercenary he would offer his services, and probably no one would pay him because they are used to the free OOC grinding and what not. But still, the idea of paying 50 GP to hire an archer is role-play through-and-through. It gives an opportunity to discuss and get an idea what those other characters are about, and quite frankly avoid some team-ups that are on the silly side. Not to mention that with previously mentioned Taunt skill investment, I could come up with stange 'insults' to see if it is worth my time to interact with some players. I mean, the way someone reacts to being called 'toothless blobfish' - 'festering cabbage' - 'three-legged horseradish' - 'spider face' - is somewhat telling whether I can actually role-play on a role-playing server or constantly walk on eggshells. And who knows, maybe with time that whiff of arrogance would result in other players calling this character a lord, without this character ever calling himself as one. I do not really have good things to say about either of the mentioned in game encounters, but you got to take the RP the server offers, I suppose. Oh, and the Dungeon Masters decided that this character was making fun of Hoihe. I honestly do not see how. 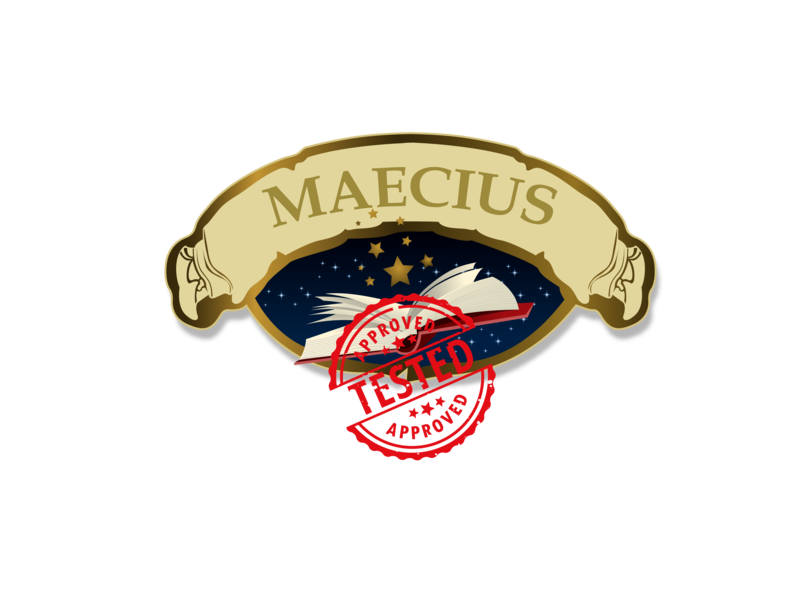 But according to Maecius it landed me a six month ban, after which I am allowed to beg and plead the DMs to perhaps let me play on this server once more. Honestly, no, I think not. I love the ability to get meat from some animals and cook it with bit of Survival skill investment. (2 points needed according to Valefort) Basically, it is a source of free potions of Lesser Vigor, which makes early leveling a lot more pleasant thing. You got wolves along the river Chiontar, then rats and bats in the hilltops. It is a great addition. So yeah, the above was my last character here.